Carlon, Chris J, Paperback, 144 pages, John Sherratt and Son Ltd., 1979, 1st Edition. The idea of writing a book on the Alderley Edge Mines was initiated some years ago. 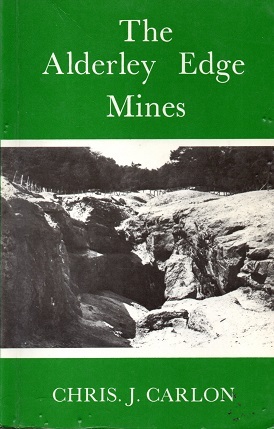 Information concerning the nature of the mining operations proved to be difficult to find, and no single volume pertaining to the mines existed. This sense of dissatisfaction at the apparent lack of information was further enhanced by geological research for a doctorial degree. The opportunity has now arisen to put pen to paper and collect together personal observations and the myriad fragments of information about the mines in contemporary records and documents, books, articles, newspapers and scientific historical and antiquarian journals.